Korra Agri - Pesticides and Fertilizers Business Unit starts 2017 with new strategic goals and objectives to enhance its services and products reaching farm growers and owners. 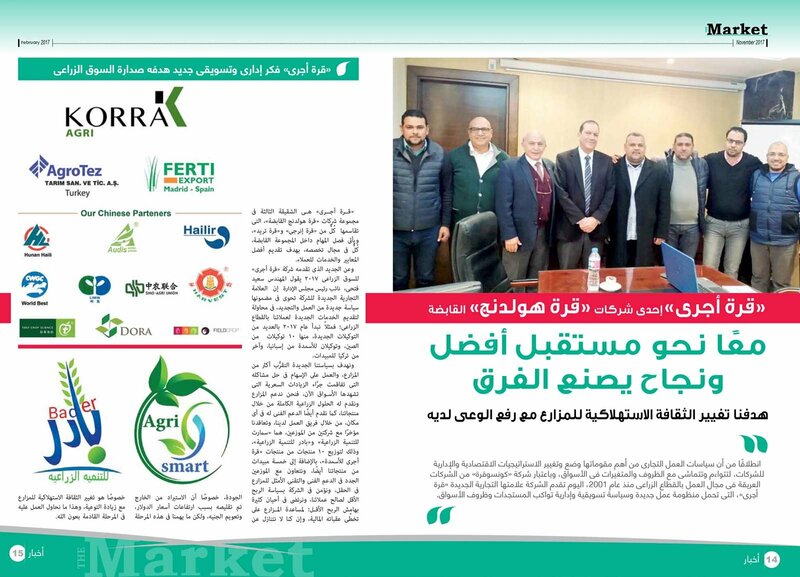 Korra Agri has started 2017 with new products, where currently they have 10 Chinese, 2 Spanish and other Turkish pesticides and fertilizers registered brands aiding farmers in reaching better yield productivity and more profitable returns. With Korra Agri’s new strategy, they are working closer with farmers, providing technical support and crop solutions that would help farmers with their crop production. They are even willing to decrease their margins at the expense of helping farmers with the current agricultural expenses after the recent market price increase. Korra Agri have also joined forces in the market with ‘Smart Agri’ and ‘Bader’ for distribution reaching new farm areas. Currently, Korra Agri’s mission is to raise farm growers’ awareness, engage them, and enhance consumer habits & purchasing decisions.